For the past two months the Church of Scotland Manse at Gott Bay has been occupied. A retired minister and his wife from Australia have been in residence. During their stay they have been serving the congregation. It has been a joy to get to know them. Ted is rather limited in the distance that he can walk. On the other hand his wife Anne loves to get out in the fresh air. Guessing company might be appreciated a visit to the broch at Vaul was suggested. Parking up close to the trig point at Vaul Ted got his head stuck into a good read. The rest of our party set out to explore the surrounding area. It was a indeed a great day for such a walk. This was the second sunny day in a row – quite a record this winter. As we walked down the track the view was so rewarding. The Atlantic roar was music to the ears. 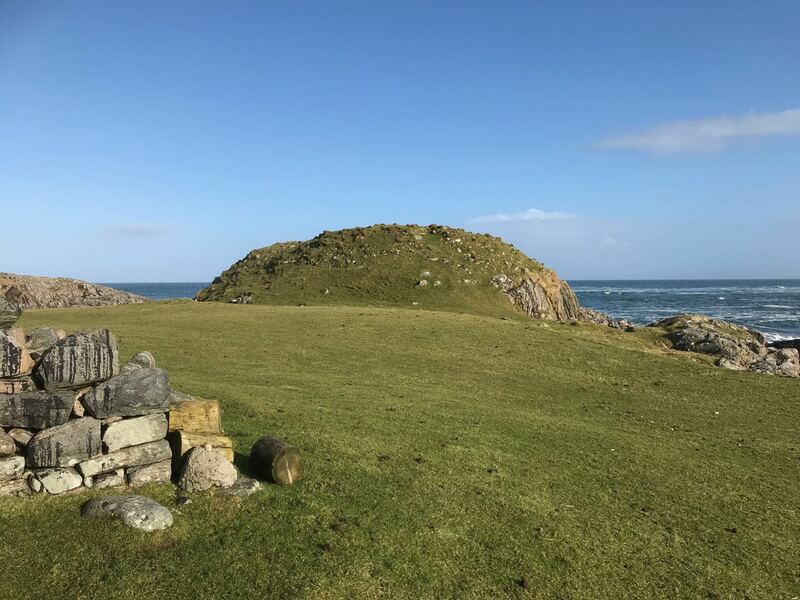 First we headed for Dunbeg, the small beach and rocky outcrops. The small dwelling down there always fascinates visitors. The ’secret passage’ was also of great interest. Anne found plenty to record on her camera to share with Ted. 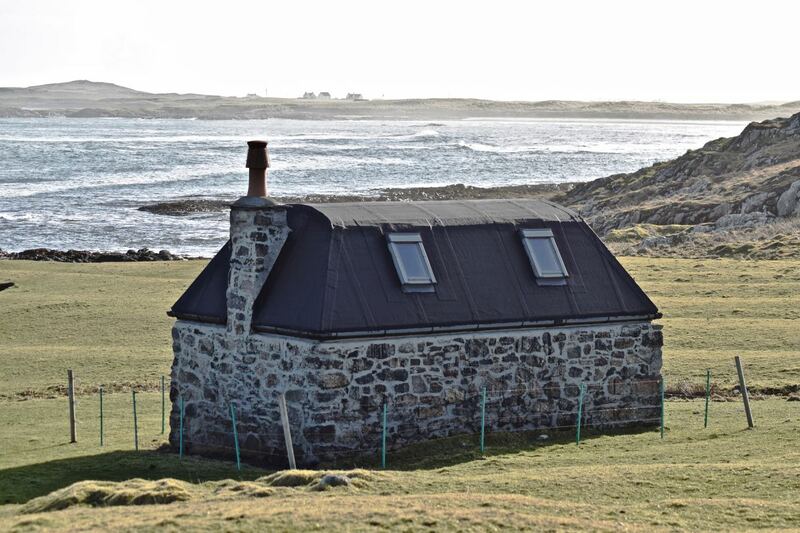 There will be plenty of views of Tiree making their way to Australia. Inside the passage were striking colours and shapes to be captured. 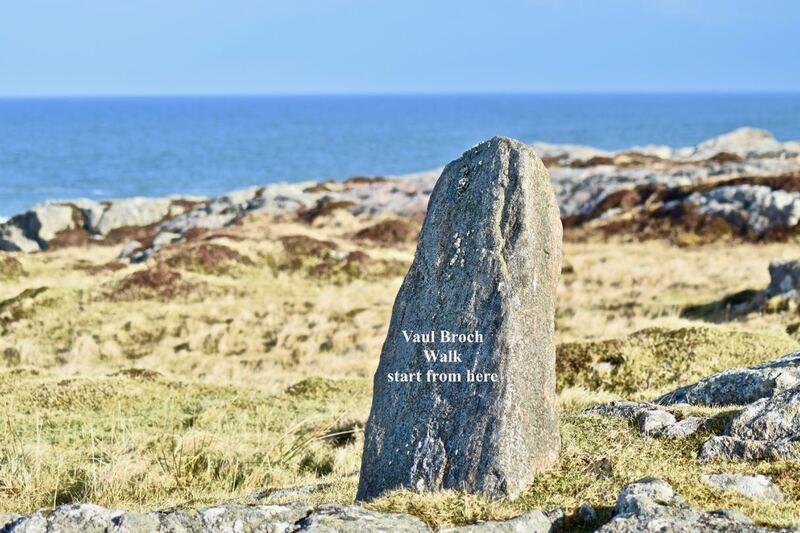 It was a real adventure traversing the short route to the Broch (Dun Mòr). The recent and persistent heavy rainfall had turned the ground into a bog. It was squelch – squelch – squelch – as we made our way up to the Broch. Up by the Broch was a lone daisy. Contrary to recent forecasts might Spring be on its way? 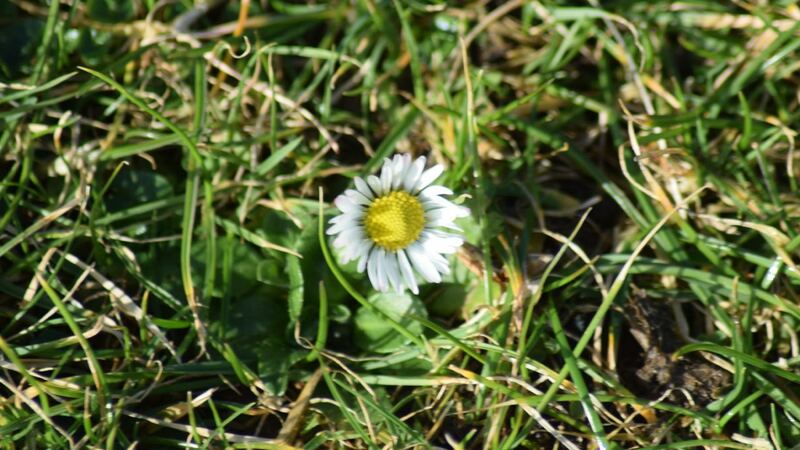 Had this little daisy found a sunny hollow to protect it from Atlantic blasts? 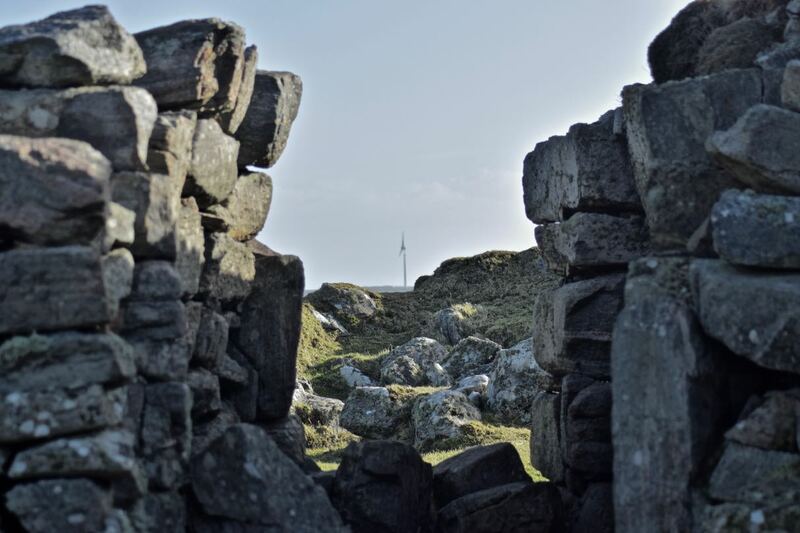 Consider the view from what is believed to be the entrance to the Broch . Little could those who had built the Brcoh have envisaged Tiley. Tiley the turbine generates electricity and income. After all that it was time for lunch. Lunch at the ‘Cobbled Cow’ got the thumbs up. Suitably refreshed we headed for Balephuil and West Hynish. 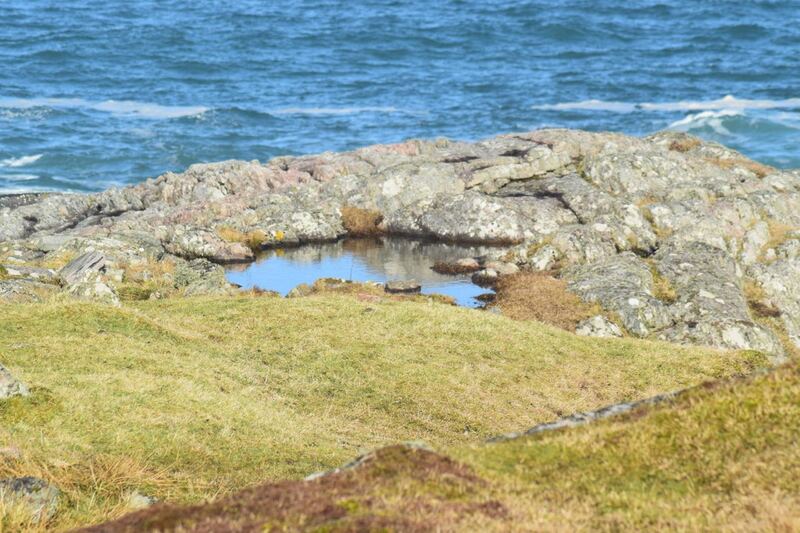 The aim of heading west was to observe the seals at West Hynish. 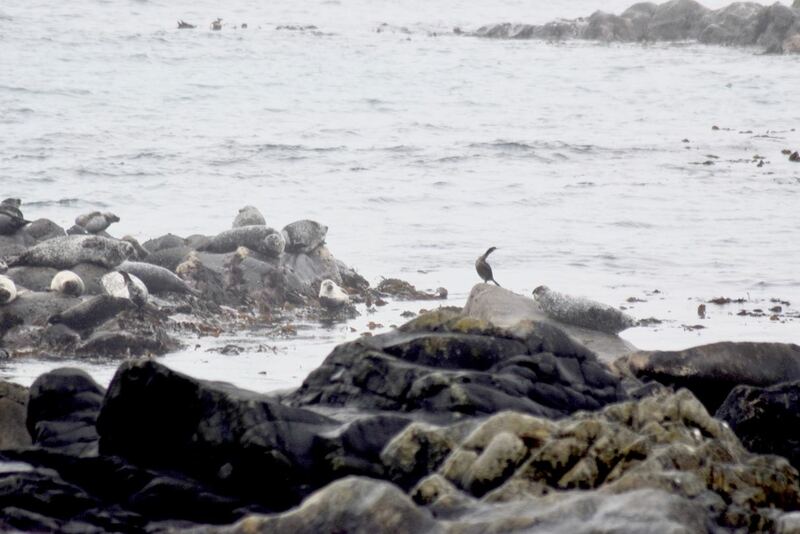 Unlike the previous day the seals were on more distant rocks. Thankfully they were still clear to the naked eye. And so was the Skerryvore Lighthouse. Once again the Atlantic Roar accompanied the squelch of our footsteps. 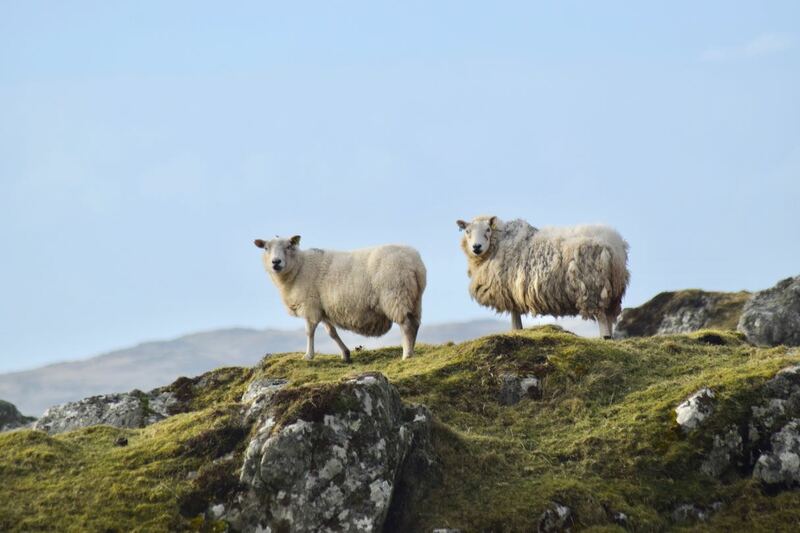 Did the look on the sheep’s faces convey a sense of bewilderment? Could anyone be so daft as to walk across these muddy fields? 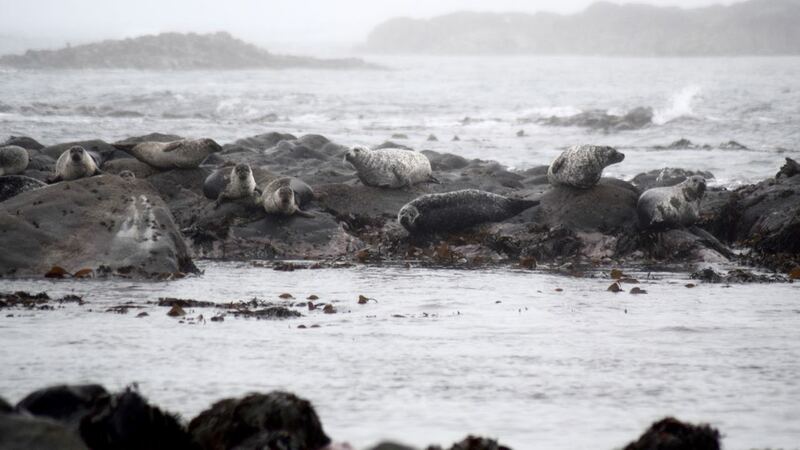 But then this is life on Tiree – a rather wet Tiree. Don’t these walkers know that there is no dry route to the beach? The Isle of Tiree welcomes visitors.